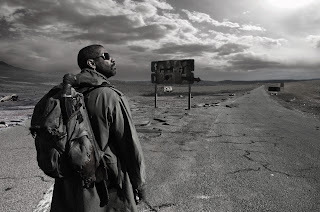 A post-apocalyptic survival movie, The Book Of Eli creates and sustains a foreboding mood of hostility, as desperate survivors start the process of scratching out new ways of living on a destroyed planet. In unexplained circumstances that appear to be the result of a nuclear holocaust, the world has been destroyed. The sun is too bright, there is a shortage of clean water, money has been replaced by bartering, and the landscape is littered with crushed infrastructure. 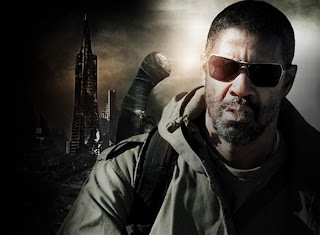 Eli (Denzel Washington) is a well-armed survivor and combat expert, and possesses the last remaining copy of the Bible. He is determined to walk west to an undefined destination, fighting off marauders who threaten him along the way. Eli arrives at a small settlement being run by Carnegie (Gary Oldman). Vicious enforcers and biker patrols do Carnegie's dirty work, while he keeps the blind Claudia (Jennifer Beals) and her daughter Solara (Mila Kunis) as his slaves. Carnegie is desperate to get his hands on Eli's Bible, to expand his influence. Eli is equally sure that Carnegie is not deserving of the book. Carnegie unleashes his thugs at Eli, who has to find a way to survive and continue his mysterious journey westwards. Borrowing heavily from the stunning look of the Fallout 3 video game and reviving many elements from Mad Max 2: The Road Warrior (1981), The Book Of Eli succeeds in portraying a post-civilized world, where the few survivors have defaulted to animalistic behaviour, and the rebooting of civilization at rudimentary settlements does not look pretty. Washington gives Eli enough humanity to provide hope for a better future, but this optimism is countered by Oldman's portrayal of Carnegie, who leaves no doubt that humans, given the opportunity, will indeed repeat all the same major mistakes that lead to the path of utter destruction. The Hughes brothers Albert and Allen direct with considerable panache, and as they steer The Book Of Eli towards its clever final twist, they seize opportunities for entertaining showboating, always finding the most engaging camera angles. In one sequence, Eli and Solara are inside a house besieged by Carnegie's men: the ensuing shootout features mesmerizing camerawork, a smooth ballet of captivating lens movement. There is undoubted Sergio Leone influence at play, and the soundtrack hints at it with the subtle whistling of Ennio Morricone music. The Book Of Eli is an artistically rich imagining of a bleak future. Humans may be heading towards mutually assured destruction, but they are determined to create good entertainment along the way.